As the warm sunny days start to disappear, and the weather starts taking a turn for the worse (or better depending on who you talk to) there is one thing that definitely helps get some of us through the cold winter weather. That’s right, NHL hockey is back! 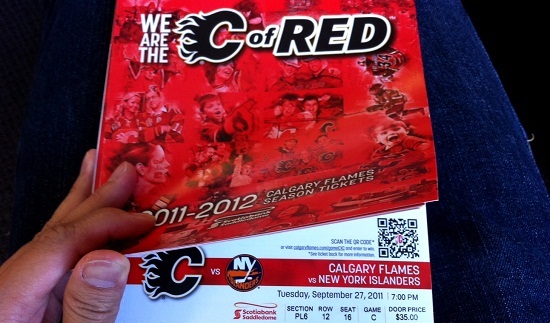 The 2011-2012 NHL Pre-Season is underway and just like last year we have a bunch of Calgary Flames tickets to give away to our readers. We’ll try to spread out some of the ticket giveaways and we’ll do our best to come up with some cool contests this year. For our first giveaway we have four tickets to the Calgary Flames vs. New York Islanders game as well as four tickets to the Calgary Flames vs. Phoenix Coyotes game. To enter the contest, tell us who your favorite Calgary Flames player is by leaving a comment using your Facebook account and have it posted to Facebook. Please also specify which game you would like to go to. We will select two winners in the comments below, one for each game. Good luck, and Go Flames Go! Winner must be able to pick up the tickets in person by 5pm on game day. Failure to do so will mean a forfeiture of the prize and a new winner may be selected. No compensation will be given. As you may have heard in the news, well actually I’m quite certain you’ve read about this because on the evening news there are no less than 8-10 different stories related to H1N1. If you haven’t I’ll provide a brief coles notes version. 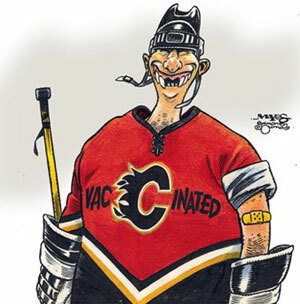 Last Friday the Calgary Flames organization were provided with their own private H1N1 immunization clinic. The clinic was open to all staff, players and their families including those from the farm team in Abbotsford, BC. A senior Alberta Health Services (AHS) staffer that approved the clinic was later fired for the serious ‘misjudgement’. While the news first broke out on Tuesday that a private clinic was setup for the Calgary Flames, the actual clinic was put on before the weekend on Friday. This is important to note as the public outrage seems a bit overboard in my opinion. AHS announced on the weekend that the province would be changing the H1N1 immunization plans due to stronger than anticipated demand. Prior to this, all H1N1 clinics were open to the general public. Now the new plan is to only allow those that are deemed high-risk to receive the shots. The planning for the private clinic no doubt took place well before the vaccine shortage was announced. So while I agree that the private clinic for the Calgary Flames should not have been put on, I believe the situation is being blown out of proportion by the media. An AHS staffer is fired over this private clinic in which 50-60 shots were given out (I’m assuming here that not everyone that was eligible to get the shots at the private clinic actually took advantage)? How many of you reading this know of people that are not in the high-risk group that went out and got shots? Are you chastising these people for jumping in front of those that need the shots? What about Dr. Andre Corriveau? He is Alberta chief medical officer of health who urged all Albertans to get vaccinated. His decision to open clinics to all Albertans instead of just high-risk Albertans was a critical mistake but he still gets to keep his job. Wait, theres more. Dr. Corriveau himself who does not work face to face with patients and thus is not considered high-risk received the H1N1 vaccine. Perhaps his boss, Ron Liepert the Health Minister should be fired too? The whole H1N1 vaccination debacle falls on him. Ultimately, some big mistakes were made from the get go and now we’re facing a vaccine shortage here in Alberta. Who gets fired? Some middle manager that approved a private clinic for the Calgary Flames? If there was no uproar would he still have his job? To argue a different point, was it really a bad idea to vaccinate the Calgary Flames? We have a semi-large organization travelling to dozens of cities in a short period of time competing face to face with other players who are also travelling all over Canada and the United States. One cannot deny that this is an excellent transmission opportunity for the H1N1 virus. Immunizing those that are travelling frequently can only reduce the chance of the virus being brought in from another city. Is that not the whole point of this mass vaccination? I hear there are people that are unloading their season tickets because of this incident. To that I say great!, more tickets for the rest of us. Today we reached 500 fans for our facebook page! If you haven’t already become a fan, you can check out our page at www.facebook.com/beyondca. We love having more fans of our FB page so if you’re on FB (seriously now, who isn’t on facebook?) become a fan right now. Speaking of social media, we recently passed 100 followers (110 actually) for our twitter page as well. You can reach us on twitter at www.twitter.com/beyondca. I know, just 110 followers, that is pretty bad. Why become a fan or follower? I know our constant begging will not get more people to join or follow us, but I do know that free stuff usually works as a bri… err, incentive. As a thank you to all of you who took a few minutes to join us on FB and Twitter we will be giving out a pair of 200 level tickets to a Calgary Flames game each month to one random twitter follower or facebook fan. For an extra chance to win, join us on facebook AND twitter. The first draw will be for tickets to the Calgary Flames vs. Detroit Red Wings game on Saturday October 31, 2009. The lucky winner will be announced on October 30th so make sure you are entered in to win by becoming a fan or follower. Check our blog page for the announcement of the winner Friday morning, the winner must claim the prize in person by Friday at 2pm or another name will be drawn. If you don’t win, don’t worry as we will give away more tickets! Seeing as how it is the Thanksgiving long weekend, I thought this thread was a perfect candidate this week. How many Thanksgiving dinners will you be attending/hosting this weekend? With the market on its seemingly endless downward spiral, it is extra important this year to take some time out to spend with family and friends. Try not to think of the world financial markets this weekend! The NHL season started this past Thursday and the Calgary Flames did not surprise anyone with their traditionally great start to the year! ;) Jokes aside, I’m glad hockey is back and this year should be another exciting year to watch with the newcomers (I say that every year). While we got owned by the Vancouver Canucks on our season opener, it looks like we do have the potential for some serious goal scoring this year. I hope I’m not wrong! A bunch of Honda/Acura owners are holding a year end meet tomorrow @ 2pm at the Home Depot Parking lot across from Chinook Centre . There is no planned cruise, so its just gonna be a big meet and chill type of event. If you’re interested in attending, sign up in the thread and post what vehicle you will be driving (it doesn’t have to be a Honda/Acura).